On the downstream side, all is well. 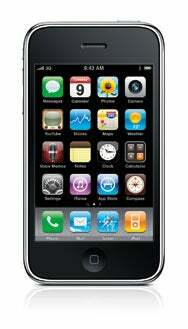 The iPhone 3G handles up to 3.6 Mbps HSDPA, and the 3GS can use the newer 7.2 Mbps HSDPA flavor. AT&T is building out the 7.2 Mbps service, which will start being available in some metropolitan areas later this year. After my HSPA article ran, reader Nick Dunklee pointed out in e-mail that a teardown at RapidRepair of an iPhone 3GS shows that it has a UMTS/HSDPA chip. UMTS is the earliest 3G standard deployed on GSM networks, and it tops out at 384 Kbps. It’s easy to test, if you have an iPhone 3GS. Go to any speed tester, like Testmyiphone when you’re outdoors with a good signal. Downstream, you might hit well over 1 Mbps; upstream, under 384 Kbps. It’s a shame that the iPhone won’t be able to send video and photos at the faster rates that laptops with 3G cards on the same network can. But I suppose this offers a new marketing bullet point for a future iPhone model—now, with HSUPA!